When we think of colors, we often think of many different shades of each primary color. Take blue for example … it can vary between colors such as baby blue, aqua, turquoise, teal, royal blue, or navy blue. Many people would assume that the one exception to these color variations is black. After all, we think of black as being absolute darkness. 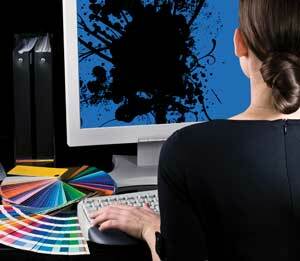 However, like all process inks, black that is used in full-color (process) printing is transparent. Rich black. Rich black combines process black with one other process ink (traditionally 100% black and 60% cyan), which causes the black to appear “blacker” because the second ink color increases its density. Use rich black whenever the edges of a black object are fully exposed, or when a black object straddles other image information. And remember, it’s only appropriate for objects that are at least a quarter-inch wide. Super black. By combining three process undercolors (50% cyan, 50% magenta, and 50% yellow), you can create the deepest, most satisfying process black you can reproduce on-press. Use super black only when all the object edges are within other colors, or when they bleed off the edge of the page.